A much anticipated release for me. I loved the debut ‘Can You Hear My Call?’ and was eager to see where Alessandro Zampieri would take us next. 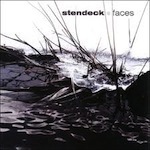 Stendeck has always given us some long track titles and this album is no exception. But the titles do have a personal meaning to the man, that is plainly evident. ‘Faces’ is another journey into what you feel is Alessandro’s emotional states and experiences. It’s utilising life’s experiences that does somehow set a lot of artists apart from others and Ale really plays on this with every note, mixing IDM sensibilities with emotional soaring synth lines as always. It has to be said; while Stendeck does have obvious influences he does create his own drama and unique style. I can spot a Stendeck track a mile away. ‘Faces’ is genuinely more full on than the last album as a whole and is a more progressive release in its entirety. Rather than any track standing outsingle handedly (as in the debut album), it is one of those immersive journey’s you must experience in full. This entry was posted in Geska. Bookmark the permalink.